I remember reading old Tintin books in high school and I really enjoyed them (along with Asterix and Obelix). Tintin as a character never made a lot of sense to me, but the stories were very Indiana Jones adventures, a pulp with terrific art in comic book form. 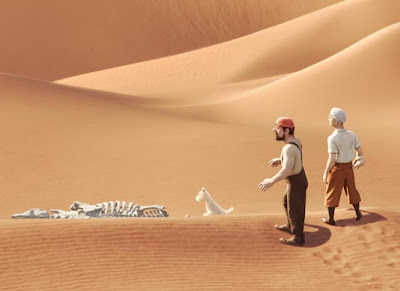 The film has some great voice casting: Simon Pegg and Nick Frost as the twin detectives, Andy Serkis as the captain, Jamie Bell as Tintin, and Daniel Craig and Cary Elwes are also involved. Filmofilia has more information. In 2010 news, movies didn't do so well. The biggest blockbuster attempts were pretty disappointing and overall, sales were lower this year than last year, the second lowest grossing year of the decade (2008 was lower). The best selling movies of 2010 in North America were Toy Story 3, Alice In Wonderland, Iron Man 2, The Twilight Saga: Eclipse, and Inception. Of them, only one was 3D and would have sold as well without it. In fact, 3D didn't seem to help sales at all, despite being shoehorned in pretty much every film possible in 2010 after Avatar's success in 2009. I was hoping Jonah Hex was going to be good: a post-apocalyptic cowboy vs zombies, its like they picked all the coolest concepts (or at least popular) for a single movie. Apparently it was just awful. 2011 looks to be an interesting year for movies. So what's missing from this list? Any original ideas or new stories.